The California Zephyr, in case you didn’t know this already, was a passenger service running between Chicago and Oakland, jointly operated by three railroads: the CB&Q (“Burlington”), the D&RGW, and the Western Pacific. Officially it ran from 1949 to 1970, using six trainsets. (There was a daily departure each direction, and due to the duration of the trip it required three trains each direction). The three member railroads purchased cars for the service based on their share of the route miles, which worked out to an equivalent of three-trains-worth of cars for the CB&Q, two for the WP, and one for the D&RGW. When the CZ finally succumbed to the economic pressures of declining rail travel, the three railroads disposed of their cars in various ways. Many found their way into private ownership; some were sold to Mexico (especially sleepers). Some served on the Auto Train for a while. The D&RGW kept most of its cars, except the sleepers, and continued using them on its newly-created Rio Grande Zephyr, a stub service that operated thrice weekly between Salt Lake City and Denver until 1983. Quite a few remnants of the complete CZ can still be found around the country. Here are a few photos of cars that I have encountered. 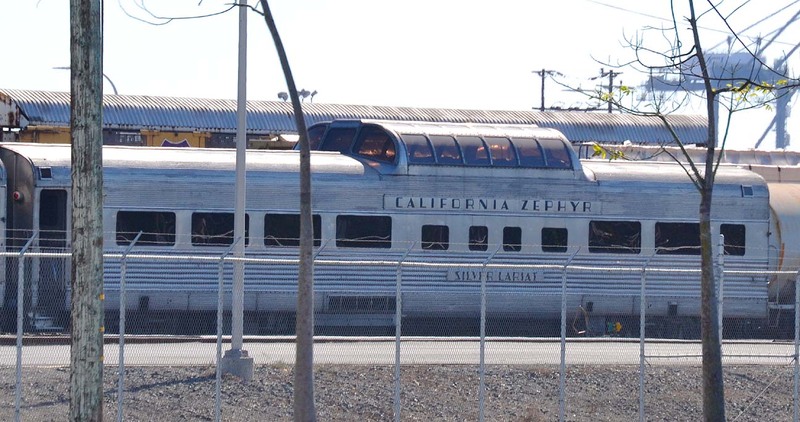 Driving around the ports of Long Beach and Los Angeles on October 30, 2015, I unexpectedly encountered three California Zephyr alumni in the yards. They are all now fitted for private car service, with all the usual electrical conversions. I apologize for the foreground clutter and the backlighting, but this location was not really accessible for parking. I felt at risk just being where I was! At any rate, here they are. Dome coach SILVER LARIAT, CB&Q car No. 4718. Baggage car SILVER PEAK. 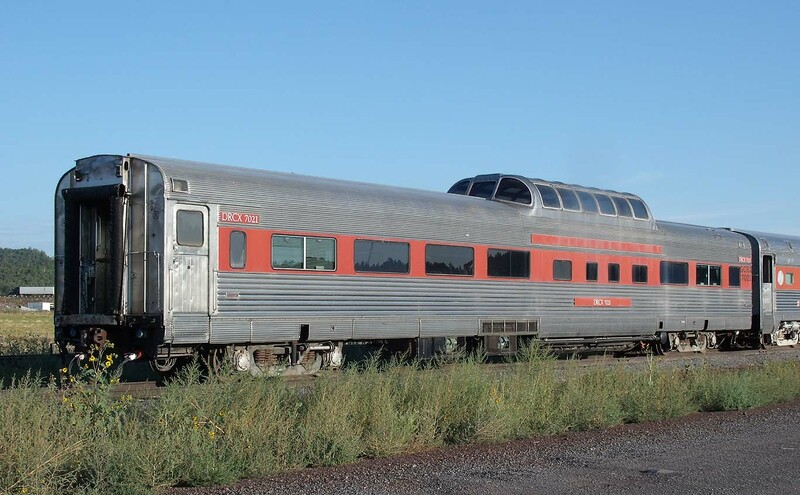 This was not actually a CZ car– it was built for the FW&D on the Texas Zephyr as a baggage-dormitory-chair car, later remodeled to strictly baggage. The Burlington acquired it in 1969 as the SILVER PEAK. It later served for Amtrak and eventually made its way here. It is longer than a standard CZ baggage and has a vestibule, but the resemblance is still strong. 10-6 Sleeper SILVER RAPIDS, a rarity in that it was a PRR car (No. 8449). Of the 21 of this design on the train, it’s the Pennsy’s only contribution. Dome Buffet-Lounge-Observation SILVER SOLARIUM, CB&Q car No. 377. There were a total of 7 such cars used, four of which were the Burlington’s. 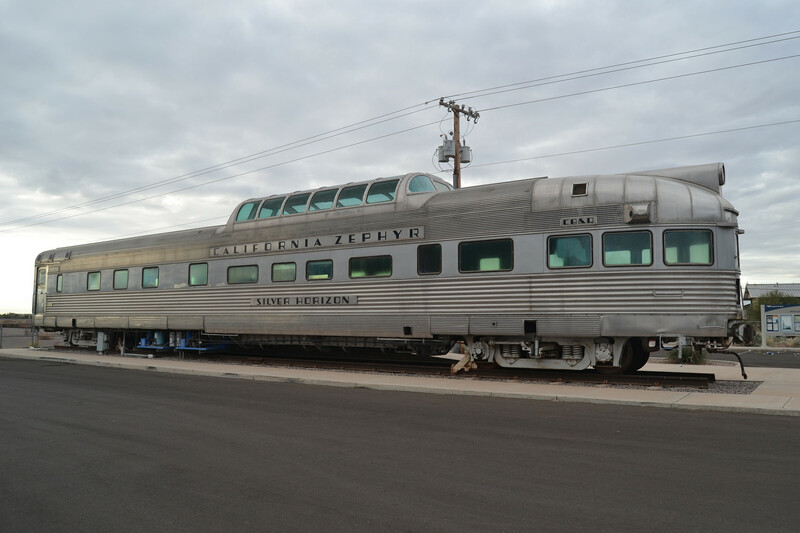 The city of Maricopa, Arizona had for a time a most unusual Amtrak station: a dome observation car of California Zephyr heritage. Now the beautiful car has been displaced by an Amshack, but it still rests across the parking lot from the depot and the tracks, stuffed and mounted (and gutted). See my Flickr Album for a complete walkaround of the car. The Grand Canyon Railway has a huge collection of passenger equipment on its property in Williams, Arizona, much of it not currently operational. One such car is none other than the former SILVER COLT, a CZ car that once belonged to the D&RGW. Roaming around outside San Diego in search of things to photograph, I stumbled blind into a CZ alumnus parked in a small industrial yard in Miramar. I jockeyed around for a vantage point; this was the best I could do. CB&Q 452 “Silver Thrush”, 6/5 Sleeper. Obviously the taggers have better access to it than I did.